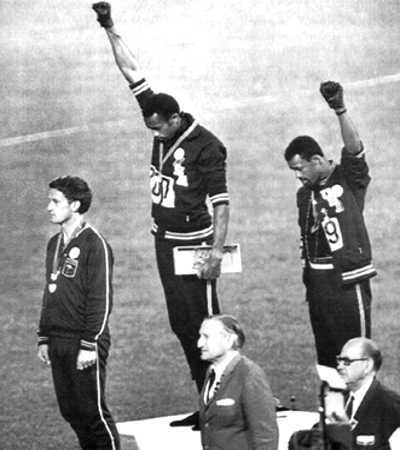 African-American sprinters John Carlos and Tommie Smith raised their gloved fists in a black power salute at the 1968 Olympics in Mexico City in 1968, while the U.S. national anthem played during the presentation of their medals. Their gesture was a show of defiance against oppression taking place at the height of the civil rights struggle in America. Tommie Smith and John Carlos give the Black Power salute at the 1968 Summer Olympics. 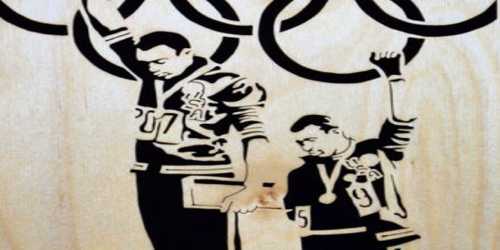 The two men were suspended by the United States team and banned from Olympic village. The action is considered a milestone of The Civil Rights Movement. When Olympic sprinters Tommie Smith and John Carlos stood atop the medal podium at the 1968 Summer Games in Mexico City, bowed their heads and raised black-gloved fists during the playing of the national anthem, millions of their fellow Americans were outraged. But countless millions more around the globe thrilled to the sight of two men standing before the world, unafraid, expressing disillusionment with a nation that so often fell, and still falls, so short of its promise. Black Power is a term that emphasizes racial pride and the desire for African Americans to achieve equality. The term promotes the creation of Black political and social institutions. The term was popularized by Stokely Carmichael during The Civil Rights Movement. Many SNCC (Student Nonviolent Coordinating Committee) members were becoming critical of leaders that articulated non-violent responses to racism. The two athletes share what Smith calls a “strained and strange” relationship. 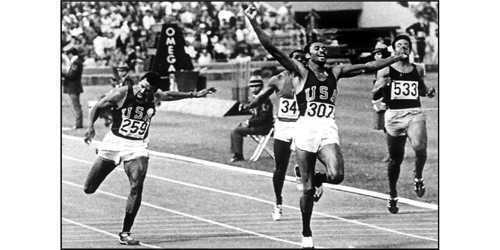 Carlos says he actually let Smith pass him in 1968 because “Tommie Smith would have never put his fist in the sky had I won that race.” Smith, who won the race in a world-record 19.83 seconds, dismisses that claim as nonsense.